Melancholy Thistle – Dig Delve – An online magazine about gardens, landscape, growing & making. 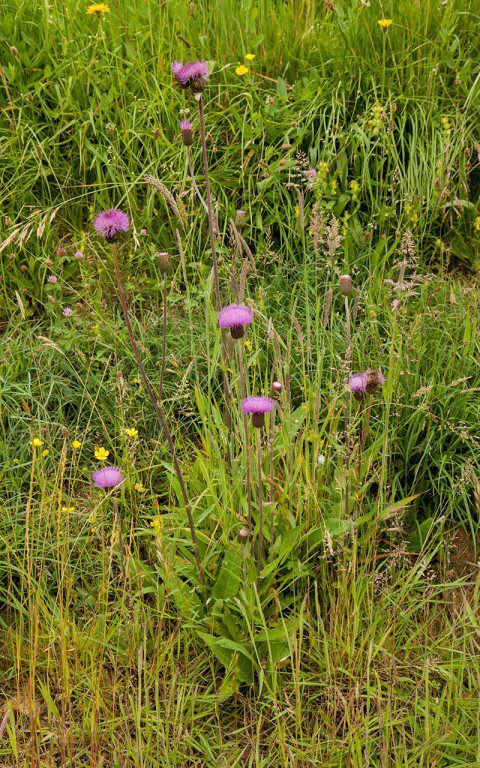 The melancholy thistle (Cirsium heterophyllum) were a late arrival at our Chelsea Flower Show garden last year. We were moving slowly and surely into the last few days of planting up the garden and Peter Clay, our plant-meister at Crocus, rolled up with a car boot full. We were in the process of studding the wildflower turf with special moments, acid yellow Zizia aurea from North America, scarlet Tulipa sprengeri, white camassias, and marsh orchids collected from Peter’s own land, to name just a few. He said it was his custom, in the last few days of the Chelsea build, to do a trawl of some of the specialist nurseries just in case there was an undiscovered prize that the garden had been waiting for. The melancholy thistle were just that, standing strong at that point and still in textured bud at about a foot high, but you could see they were set on taller things. I didn’t want the garden to be an all-singing, all-dancing place. I wanted people to imagine they were somewhere real, where there were still things to look forward to. So I planted them under our pollarded willow and, over the course of the show, they grew tall and provided a sense of potential with their spineless, silver-felted foliage and beautiful scalloped buds. When the garden was dismantled I took one of the thistles as a memento. 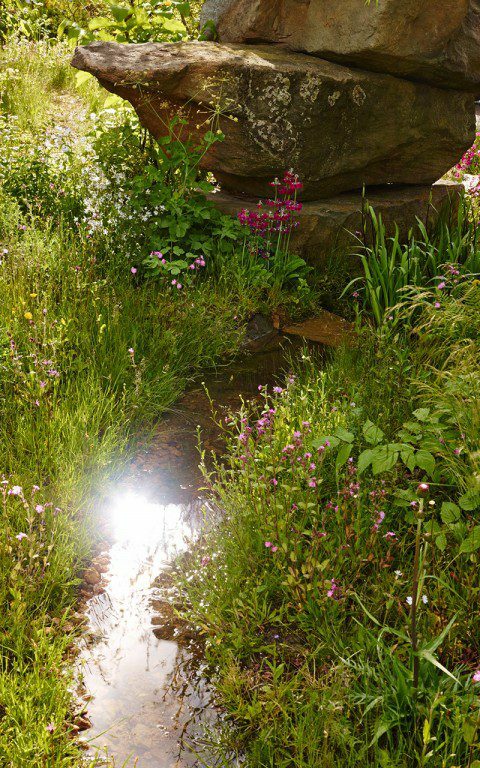 They had taken on a far greater significance during the course of the show, since I was standing amongst them when one of my most loved musicians complimented me on the garden and I invited her in to have a closer look. It was a chance happening which caught me completely by surprise and, out of nervousness, I talked far too much. Suddenly the bubble was burst, she had to leave, and I missed my chance to express my admiration. I felt foolish for perhaps having overwhelmed her and, as I pondered the thistles, a little sad that I had not simply let her look. These sorts of experiences are what gardens are made of and, back home, the memory of the meeting grew with the thistle and I haven’t been able to pass the plant this year without thinking of it. 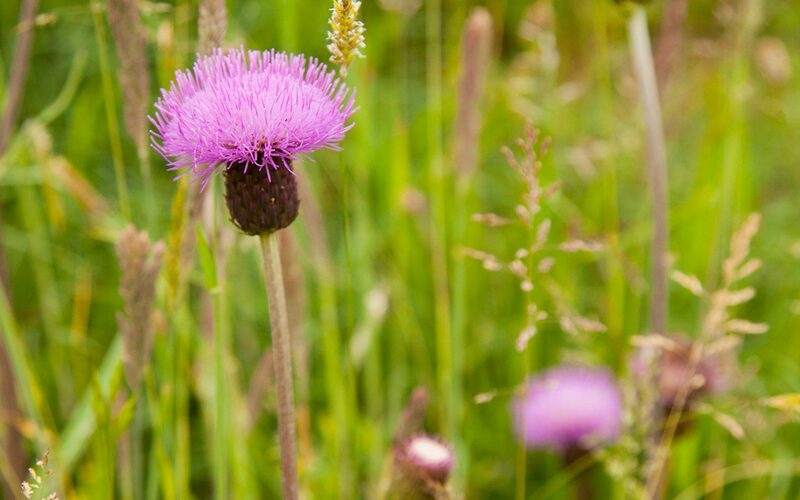 A fairly rare British native, Cirsium heterophyllum can be found in wet meadows and on river banks in the uplands of Scotland, Wales and Northern Britain. So I found it a special place that I thought it might like on a bank where we have spring seepage that keeps the ground moist. It spreads rhizomatously and my solitary plant has doubled its domain this year, and, so far, is holding its own amongst the meadow grasses. Despite the size and resonance of its shaving-brush flowers, I have no intention of introducing it into the garden, as I can tell that it would be mingling with, and then choking, its neighbours in no time. However, checked by company in the meadow, it is a fine addition, glowing like a magenta beacon for a month in June and July. I must admit to being more merry than melancholy that it has taken so quickly here, and I hope it will colonise the damp ground around it so that one day this part of the upper meadow will blaze. To help, I harvested a seed head picked just before the seeds were dispersed by the wind. I will sow it fresh, straight onto compost, and then top it with grit to keep off the slugs and ensure it doesn’t rot. With luck we may see seedlings this growing season. I will leave them undisturbed over winter and then prick them out to grow on next spring. I expect to be able to plant them out as the weather cools next September, for a bank full is sure to eclipse any lingering sadness.